A jewel along Florida’s Emerald Coast, Destin is known for sugar white beaches, emerald green water, golf courses, world famous fishing and variety of shopping venues. 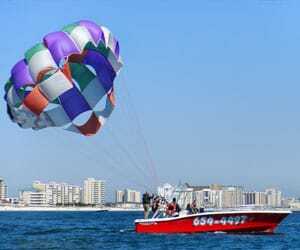 Destin is known as “The World’s Luckiest Fishing Village” and provides a variety of fishing, attractions and entertainment at the Destin Harbor. Destin is home to a variety of festivals and events throughout the year. Some of the most popular are the Destin Fishing Rodeo and the Destin Seafood Festival. Destin provides a variety of premier condominiums and vacation homes for your visit to the Emerald Coast. Two popular Destin golf resorts are Regatta Bay Golf and Country Club and Kelly Plantation Golf Club. Each resort offers excellent amenities and real estate ranging from undeveloped lots to luxury homes. The popular Henderson Park Inn is Destin’s only beach front bed and breakfast and overlooks more than a mile of the most pristine, undeveloped white sandy beaches. This luxurious all-inclusive resort is a New England-style Gulf front retreat that is adults-only. If you would rather catch a sale than a fish, Destin is a shopper’s dream. Destin Commons is a premier outdoor mall featuring a variety of retailers including Bass Pro Shop, Belk, Ann Taylor Loft, Bananna Republic and many more. Popular restaurants at include HardRock Café and Jonny Rockets. The summer 2014 expansion of Destin Commons added more major retailers like H&M, Chipotle and a bowling venue. Destin also has many additional shopping areas with national, regional and local retailers. You’ll also find an array of spas offering traditional and newest unique treatments along the Emerald Coast. While you’re in Destin, The Nathan Abbott Team recommends trying the great food and service at Cuvee Bistro. Cuvee Bistro features fine dining and cuisine by well-known Chef Tim Creehan. You can also enjoy casual dining in the bar with one of Destin’s best happy hours. Northwest Florida Regional Airport has recently expanded their flights for a total of 50 non-stop flights daily to primary hub cities across the nation, making domestic and international connections easy. Destin Jet at Destin’s private airport also makes reaching this Emerald Coast jewel a breeze. 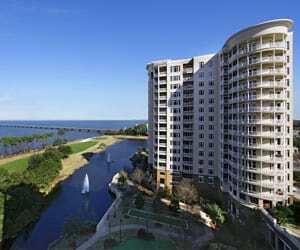 Towering 19 stories above the beach, Pelican Beach Resort offers some of the most spectacular views on the Emerald Coast! With a total of 340 units, Pelican Beach Resort features a selection of resort amenities second to none. The full amenities package includes a choice of three pools, a spa, fitness center, conference center, pool/beach bar, deli, tennis courts, covered garage parking, game center and more. Located in central Destin and on its own beautiful beach, SunDestin features spacious condominium units with private balconies, fully equipped kitchens and breathtaking views of the Gulf of Mexico. The many on-site amenities, including over 3,000 sq. ft. of meeting room space, makes SunDestin the perfect destination resort for vacations, reunions or business meetings. This resort condominium is located directly on the beach in the heart of Destin. All of the units include a wetbar, washer/dryer and an in-room safe. Penthouses units feature a private steam shower, sauna and whirlpool. Other onsite amenities include a community pool, a hot tub, sauna and a fitness center. 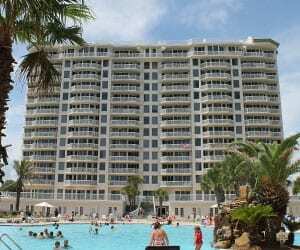 Silver Beach Towers Resort is a family-oriented, luxury, Gulf-front condominium located in central Destin, Florida. Silver Beach consists of two amazing towers of condos. The Silver Beach Towers Resort offers 600 feet of private beache, two Gulf front pools, free wifi, hot tub, tennis court, private covered parking, BBQ grills, and more. Only eight stories tall and nestled in the heart of Destin’s beachfront, Sterling Sands is a low-density community offering resort style living. Most condominiums are equipped with a full-size kitchen, washer & dryer, televisions, cable TV, DVD players and/or VCRs, linens & towels, as well as starter kits of coffee, Gilchrist & Soames soaps/shampoos and dishwasher detergent. Sterling Sands amenities include over 300 feet of private beach, private balconies, free-form heated pool, outdoor spa/hot tub, fitness room, conference/reception facility, covered barbecue area with gas grills and picnic tables, beach service, free wifi and DVD rentals for Sterling Guests. This high-rise resort features units with spacious interiors, whirlpool garden tubs, ceramic tile, washer/dryer and gulf views. Special property amenities include a 30-seat indoor theater, workout area, a seasonally heated pool, tropical gardens, sun decks and a dreamy oasis pool. Signature Beach is a luxury condominium project in Destin, FL with only two properties per floor, totaling 18 residences. All condos have nearly 3300 square feet with 4 bedrooms and 4 baths, and walls of windows. The project features an infinity edge pool on the top of the building and stunning view of the Gulf, Bay and downtown Destin. 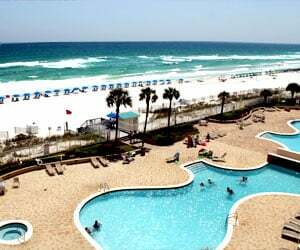 Silver Shells is an exclusive gulf-front beach resort located directly to the west of Henderson State Park in Destin. Offering 2 and 3-bedroom units, 5 high-rise condominiums reflect elegant living in an upscale environment. Enjoy the many amenities including a day spa, state-of-the-art fitness center, restaurant and gulf-front tiki bar, poolside cabanas, an indoor/outdoor pool and a 7,500 sq. ft. lagoon pool. Silver Shells’ five condiminium building are St. Barth, St. Croix, St. Lucia, St. Marteen and St. Thomas. Accommodations at Destin Pointe Resort range from a cozy community of cottages to the multi-level mid-rise condominium Magnolia House. This gated community boasts more than 3,000 feet of sugar-white sandy beaches and tropical landscaping, with courtyards sprinkled throughout to create the perfect beach vacation to Destin. Two lakes offer a place to watch the coastal birds and with two lighted tennis courts, a shuffleboard area, swimming pools, and a fitness facility, there is plenty to keep busy. This upscale gated community is one of the most exclusive communities that Destin has to offer. Featuring some of the most luxurious vacation homes on the gulf coast, Dunes of Destin amenities include private beach access, a community pool, a stunning lake with beautiful fountains and gazebos. Indian Bayou is a golf course community on the bayou in Destin and features deep water for very large yachts. Kelly Plantation is an exclusive, gated golf community located on Choctawhatchee Bay. Kelly Plantation properties within the nine neighborhoods range from residential estates to luxury condominiums. Numerous parks and walking trails beautifully coexist with an abundance of natural wetlands and marshes full of wildlife, fish and birds. The 18-hole championship golf course boasts over 7000 yards of greens along miles of bay front shoreline. The Kelly Plantation Golf Clubhouse and Grills offers casual dining and hosts private events. Regatta Bay is a master planned, gated community offering residents an award winning golf course and spectacular natural landscape along the Choctawhatchee Bay. Regatta Bay offers luxury homes, condos, apartment and vacant residential lots. Regatta Bay Golf and Country Club boasts 16,000 square feet of space including plush locker rooms, private library, golf shop, golf cart storage and unparalleled views. The community is nestled on nearly 120 acres of protected nature preserve and is certified by Audubon International as a member of the Audubon Cooperative Sanctuary System. Emerald Bay is a bay front golf course community located in both Okaloosa County and Walton County. Emerald Bay offers a variety of single family homes and condominiums. The Emerald Bay Golf Course was renovated in 2014 and includes new and enlarged greens and tee boxes, new bunkers, new cart paths, several new water features and bridges as well as enhanced and additional practice facilities. The park is primarily a water park, with over forty water attractions and also features several thrill ride attractions and a miniature golf course. Local private airport offering comfortable first class facilities for travelers and pilots alike. Family fun center with 2-18 hole miniature golf courses, bumper cars, bumper boats, kiddie rides, 5 go-kart tracks, arcade games, sky flyer, and bungee. Featuring over 6,000 feet of natural scenic shoreline, boardwalks, six pavilions, a playground, nature trail and camping sites. Over 70 well-known retailers and restaurants, splash park, play area, mini-train, AMC IMAX movie theatre and more. If you are interested in purchasing real estate in Destin, the Nathan Abbott Team is here to guide the way. View available Gulf front condos listed in Destin or contact our Buyer Specialists at 850-812-3261to schedule a consultation. Ready to Make Your Move to Paradise? If you are interested in purchasing or selling property along Florida’s Emerald Coast, The Nathan Abbott Team is here to guide you and be your trusted real estate advisor.